Change your House, and Change the World! Millions of North Americans renovate their homes every year, spending more money annually on renovation than on new home construction. And many want to remodel in ways that are as healthy and environmentally friendly as possible. But there are so many decisions to consider that making wise, green choices is not easy, and would-be remodelers are left not knowing where to look for advice. Now they need look no further than this all-new encyclopedic how-to of all you need to make your home green. 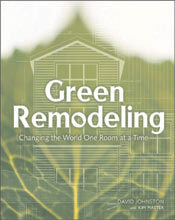 Green Remodeling: Changing the World, One Room at a Time, by David Johnston and Kim Master is a resource that so many have longed for. Not only does it provide practical and factually accurate information about the whole task of remodeling, but it is packed with information about how to do it in ways that are energy-conscious, healthy and environmentally responsible. To put the reader at ease, the book starts with David Johnston's own tale of remodeling--adding an office to his 1973 home--complete with diary entries of the process, tips and advice, and photos of before and after. Pursuing the conversational tone, the authors then point out the advantages of green remodeling: more energy-efficient, more resource-conserving, healthier for occupants and more affordable to create, operate and maintain. Room by room, the book outlines the intricate connections that make the house work as a system. For example, how new windows may affect the structure and mechanical systems of the rooms below, the health of the family, and the future of old-growth forests. Then, in an easy-to-read format complete with illustrations, checklists, personal stories, expert insights and an extensive resource list, it discusses simple green renovation solutions for homeowners, focusing on key aspects of the building including foundations, framing, roofing, plumbing, windows, heating and finishes--as well as a chapter on solar energy. 400 pages 7.5 x 9"
This comprehensive guide to green remodeling techniques gives homeowners the tools to select a contractor or architect, understand their home as a system and the impacts of their decisions on the environment, and provides detailed descriptions of green options. 368 pages 7.5 x 9"